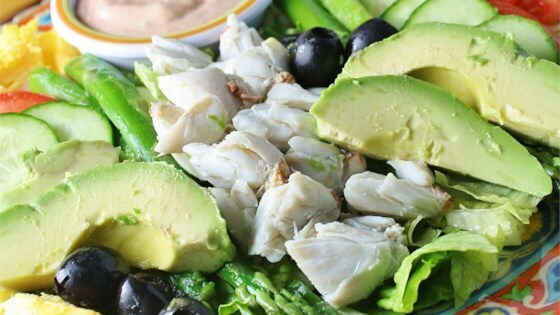 "This California original of seafood atop fresh greens is defined, in part, by its creamy Thousand Island dressing. If you wish, you can use either all shrimp or all crab meat." Dress up any shrimp or crab summer salad with this classic Louie dressing. For those looking for "true" Louie dressing, try Remoulade Sauce a la New Orleans. Be sure to read the comments. I am sure this is a good seafood salad --- but is not a "Louis" salad. Try using an authentic Louis dressing instead. Made with bottled thousand island dressing for the sake of quickness. Very good. Will make again!! Delicious! Love the dressing. Scotty - thanks for sharing such a rockin recipe!